Sanctioned by the Women’s Professional Rodeo Association (WPRA) and the Professional Rodeo Cowboy Association (PRCA), barrel racing is one of four timed events in rodeo. While both women and men compete at the youth and amateur level, this sport is primarily a rodeo event for women. Originally developed as an event for women, the pattern that contestants were required to run alternated between a figure-eight and a cloverleaf pattern until the cloverleaf pattern was favored over the figure-eight because of its difficulty in the early 50s. Combining the barrel racer’s horsemanship skills and the horse’s athletic ability, barrel racing is a fast-paced event that requires the rider to successfully maneuver a horse in a cloverleaf pattern around three barrels placed in a triangle formation in the center of the arena. Like the other three timed rodeo events, the purpose of barrel racing is to make a run as fast as possible. The time is measured by an electric eye, a device using a laser system to record times, or by a judge who drops a flag to let the timer know when to start and stop the clock. As a contestant enters the arena at full speed on her horse, the timer begins when the horse and rider cross the start line. With one barrel on the left and one barrel on the right side of the arena, contestants are allowed to run around either the left or right barrel first. However, if the horse deviates in any other way, the rider is disqualified. After making it around the first barrel, the rider will run across to the barrel on the opposite side of the arena, before sprinting toward the third and final barrel. After making it around the third barrel, the contestant will run as fast as they can toward the finish line where the clock will stop once they cross the line. 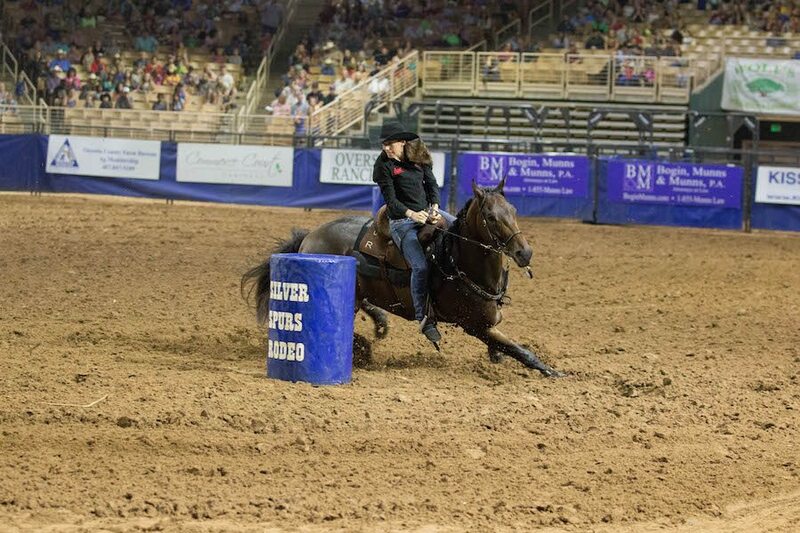 Barrel racers are allowed to touch the barrel, often to keep it from falling during their ride. But if at any point they knock down a barrel, they’ll receive a time penalty of five seconds per barrel they knock down. As the barrel racer runs into the arena, they must first run around both barrels on the side of the arena.